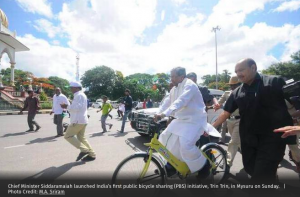 Chief Minister Siddaramaiah on Sunday launched India’s first public bicycle sharing (PBS) initiative — Trin Trin — in Mysuru A short video detailing various aspects of Trin Trin and a mobile app were also released on the occasion. While more than 600 cities across the world were already providing bicycles as a commuting option, a number of cities in India including Bengaluru were planning to adopt the public bicycle sharing system. However, Mysuru, a cultural and heritage city with a population of 12 lakh people, was the first city in India to have a public bicycle sharing system, he added.